In the physiological sense, warming up refers to the process of increasing blood to flow to the muscles that are to be engaged in the planned exercise. Heightened blood flow to muscles means an increase in oxygen delivery to tissues and the removal of carbon dioxide, a harmful toxin for muscle performance. The benefits of warming up are related to a rise in muscle temperature, which leads the dissociation of oxygen from hemoglobin, quickens metabolic chemical reactions, and results in more efficient cellular processes. A reduction in muscle viscosity then increases the sensitivity and speeds up the nerve impulses that allow for faster communication between neurotransmitters. 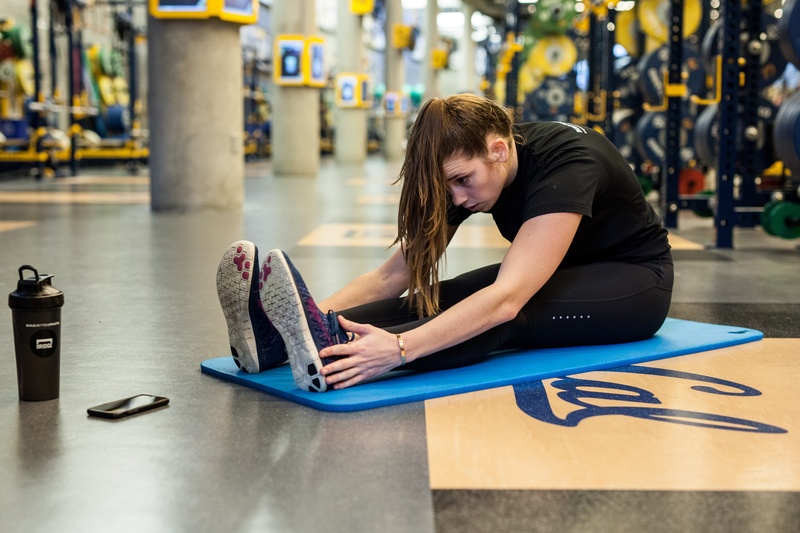 Maintaining good flexibility through warm up exercises has shown protective benefits by helping prevent musculoskeletal sport-related injuries. These changes allow muscles to move quickly and efficiently and help connect the brain with relevant motor patterns for the upcoming activity, all while minimizing injury. A good example of a way to begin a warm up is by completing this dynamic warmup video series. There are different types of warm ups that athletes can use prior to a competition or training. Teams usually do a general warm up with exercises the whole team does together, such as jogging, steady swimming, passing, or anything that increases muscle temperature while avoiding muscle fatigue. A study in the Journal of Strength and Conditioning Research examined different lengths and intensities of a general warm up to find which strategy worked best, prior to strength training. Of the four conditions tested, a longer and less intense general warm up (15min, 40% VO2max) provided the best results for a leg press (1 repetition maximum) following the warm up. The progression of warming up should start at a low intensity and end with more increased specificity for individual athletes. On the back end of a workout, cooling down can be extremely beneficial for maximizing athletic performance and speeding up recovery. When a race or workout is over, cooling down is an important step in helping an athlete’s muscles clear lactate and other waste, while loosening tight muscles. Andrea Fradkin, an associate professor of exercise science at Bloomsburg University in Pennsylvania, has completed extensive research about the validity of cooling down and how it is proven to prevent the buildup of blood in the veins. During prolonged, vigorous exercise, blood vessels in the legs expand, meaning that more blood moves through them. If an athlete stops exercising abruptly, and that blood pools in their lower body, this can lead to dizziness or even fainting. Athletes can avoid this problem all together by taking a few minutes to cool down after a strenuous workout, which will also increase recovery time. After a demanding practice or competition, it is critical that athletes take a few minutes to gradually cool down and give their muscles the opportunity to lengthen out and relax. A cool down will usually include gentler cardiovascular exercises and stretching movements, which will help the body dispose of any harmful toxins that can cause muscle aches and stiffness. In contrast to a warm up, the main goal of a cool down is to slowly decrease the body temperature, lower an athlete’s heart rate, and reduce against injury. If athletes choose not to participate in a cool down, they are more susceptible to blood buildup in their veins and soreness the next day. When the body is in motion, the blood can easily return to the heart to be re-oxygenated and recovery will be faster. A great habit for athletes to adapt as part of their cool down is to foam roll. To learn more about the benefits of foam rolling read this article. It’s essential for all elite athletes to take the necessary time to prepare their bodies for their athletic performance. Athletes can use a general warm up to increase muscle temperature and sport-specific movements to get their body sharp. Cooling down after practices and competitions for a continuous period of time will maximize recovery and prevent against injury. If an athlete is going to put in the time to maximize their athletic performance, they must also put in the time to properly warm up and cool down their bodies. To learn more about the benefits of stretching, check out this article. Warming-up and stretching for improved physical performance and prevention of sports-related injuries. Int J Sports Physiol Perform. 2014 Jan;9(1):145-50. doi: 10.1123/ijspp.2012-0345. Epub 2013 Apr 9. Does warm-up have a beneficial effect on 100-m freestyle? Neiva HP, Marques MC, Fernandes RJ, Viana JL, Barbosa TM, Marinho DA. J Strength Cond Res. 2013 Apr;27(4):1009-13. doi: 10.1519/JSC.0b013e3182606cd9. The effects of different intensities and durations of the general warm-up on leg press 1RM. Barroso R, Silva-Batista C, Tricoli V, Roschel H, Ugrinowitsch C.
J Strength Cond Res. 2012 Apr;26(4):1130-41. doi: 10.1519/JSC.0b013e31822e58b6. A dynamic warm-up model increases quadriceps strength and hamstring flexibility.Aguilar AJ, DiStefano LJ, Brown CN, Herman DC, Guskiewicz KM, Padua DA.